Is GDAX Down Right Now? Looks like the gdax trading bots are glitching.. When I login in @gdax, the 1° thing I see is bcash, is @coinbase anti @btc? Seems @Coinbase / @GDAX support is non-existent. @GDAX I cannot access the site, is unplanned maintenance taking place? @GDAX I transfered BTC over 3 hours ago. Saw now that transactions are delayed. How long wait am i in for? If a #BTC falls through the floor and @GDAX is down for maintenance, does it really happen? Is @GDAX down or is it just me? 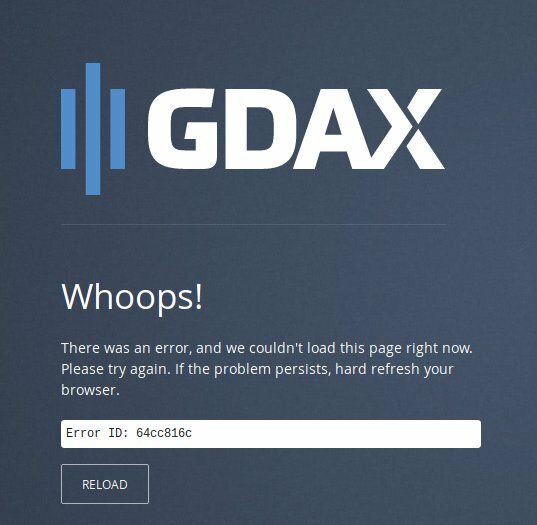 @GDAX down ? #Gdax down ? Page is not reloading ? Anyone seeing this ? Anyone having issues trying to buy on coinbase/gdax using Bank of America DEBIT?